University of San Diego’s internationally recognized School of Business Administration offers a highly personal academic experience that gives students the tools to become world-class business leaders. For 40 years, the school has provided rigorous, values-based undergraduate and graduate business programs that accelerate personal and professional growth. 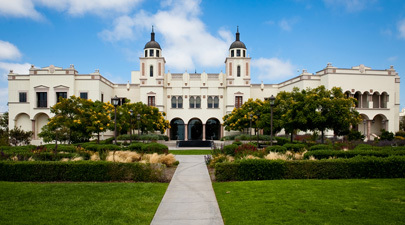 Graduates of the University of San Diego’s business programs hold leadership positions across industries and sectors, and have been shaped by faculty that focus on teaching quality and an academic program that emphasizes ethics, the triple bottom line, and the role of business in society. To apply for admission to USD's MBA programs, prospective students must hold an undergraduate degree from an accredited college, with a GPA of B or better. For the most recent incoming class, students had a mean GMAT score of 669. The same year, International MBA candidates had an average GMAT score of 602, and evening MBA students averaged 601 on ...To apply for admission to USD's MBA programs, prospective students must hold an undergraduate degree from an accredited college, with a GPA of B or better. For the most recent incoming class, students had a mean GMAT score of 669. The same year, International MBA candidates had an average GMAT score of 602, and evening MBA students averaged 601 on the GMAT. For all MBA programs, a minimum of two years of professional work experience is expected. “USD has a job placement office dedicated solely to its MBA students. This office provides direct connections to regional, national, and international employment opportunities, internships, and contract projects.” The career services personnel “are knowledgeable and dedicated recruiting professionals clear in their mission of providing every MBA student with the information and connections necessary to secure the career of their dreams.” The majority of students appreciate the “stellar” career placement services staff. They do “an excellent job assisting MBA students find the right companies that will enable them to achieve their career goals.” One student defends them in response to a few complaints from classmates: “The career services department for the MBA program offers as much support as a given student wishes to receive. It's true that they don't land the job for you, but they do offer you every tool available to find and land the job yourself.” “The school is well integrated with the surrounding business community and alumni.” The school provides “job fairs, recruiting events,” and “a large network that includes Alumni and the professional world.” Additionally, “the school makes teamwork an important part of the curriculum and as a result the students are eager to work together and help each other out.” A student in the middle of a career transition explains that because of this group interaction, “I have gotten my foot in the door of four different companies by networking with my classmates.” Companies recruiting on campus include: Cymer, Hewlett-Packard, California Bank & Trust, Jack in the Box, Qualcomm. Full-Time MBA - 22 months; International MBA(IMBA) - 22 months; Evening MBA - 2 to 3 years, flexible pace; MS in Executive Leadership MS in Global Leadership MS in Accountancy MS in Taxation MS in Real Estate MS in Supply Chain Management. 2nd year MBA students are paired with 1st year students to provide assistance with the 1st year of study. Want more info about University of San Diego, School of Business Administration Executive MBA? Get free advice from education experts and Noodle community members.